An investigation has been executed to study the influence of energy dissipation on free convection boundary layer flow in a Jeffrey fluid over a horizontal circular cylinder with suspended nanoparticles. Mathematical formulation is modelled in terms of partial differential equations with some physical conditions. The suitable non-dimensional and non-similarity variables are introduced to transform the system of equations and then the resulting equations are solved using the Keller-box method. The graphical results for the temperature profile and Nusselt number are plotted and explained for several values of Brownian motion parameter. This study reveals that the Brownian motion parameter has caused the increment in the temperature profile while decrement in the Nusselt number. The theoretical results generated in this study are important to the researchers and engineers as they can be used as a reference or basis for comparison purposes especially for validating data or experiments in the future. 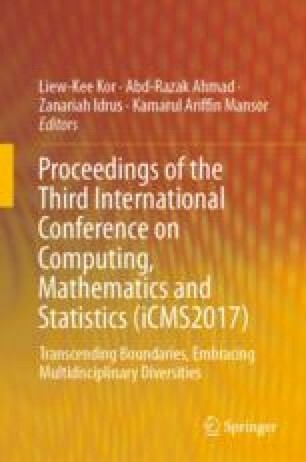 The authors are grateful to the funding provided by Universiti Malaysia Pahang (UMP) through grants PGRS1703100, RDU170358 and RDU150101.